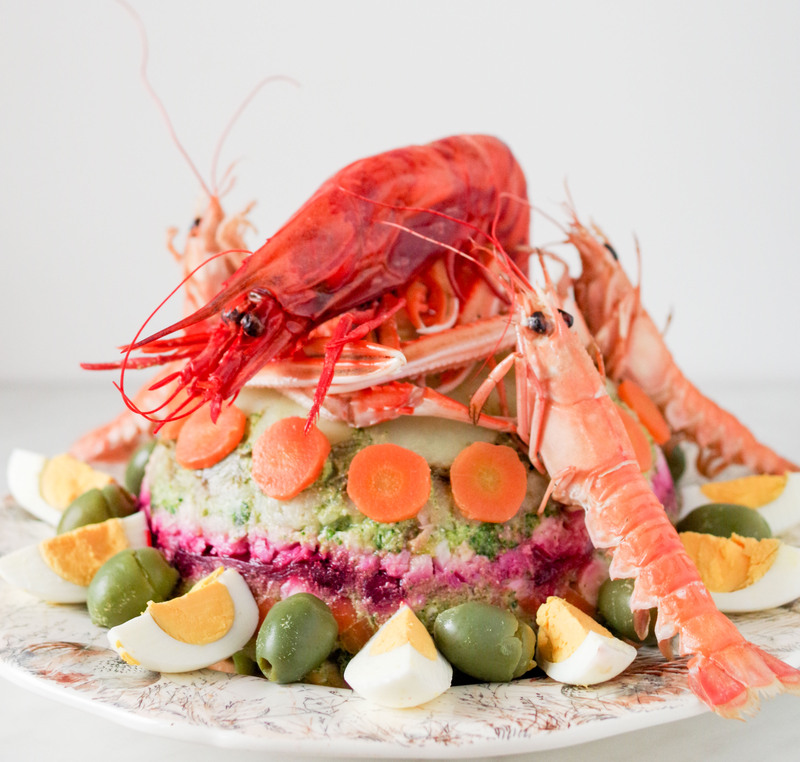 Cappon magro, such a curious recipe. Born as a poor dish, consisting mainly of leftovers and fish of little importance, over the years it became the most festive and sumptuous preparation of the Ligurian cuisine, if not even of the Italian one. 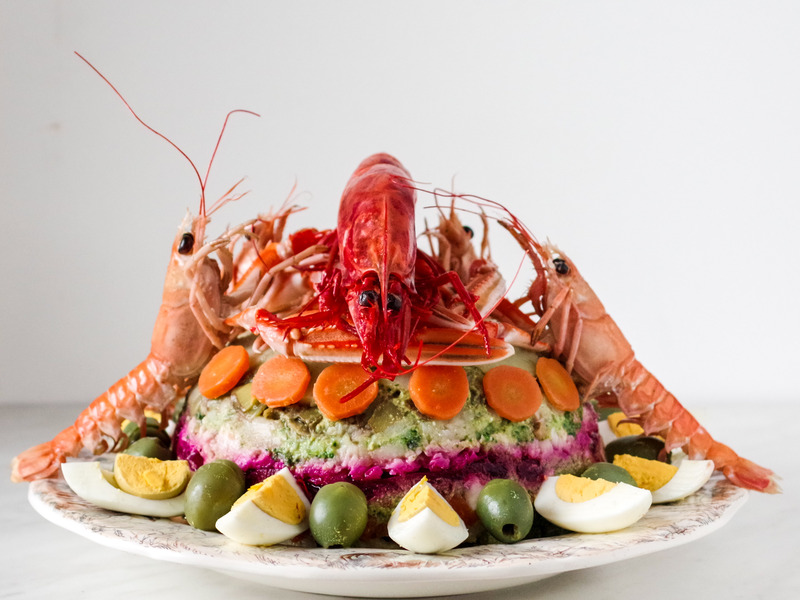 A majestic dome composed of alternating layers of various fishes and vegetables dressed with a green sauce, surrounded by shellfish, surmounted by large and showy crustaceans and richly decorated with eggs, olives, capers and vegetables. An architectural exercise rather than a culinary one. 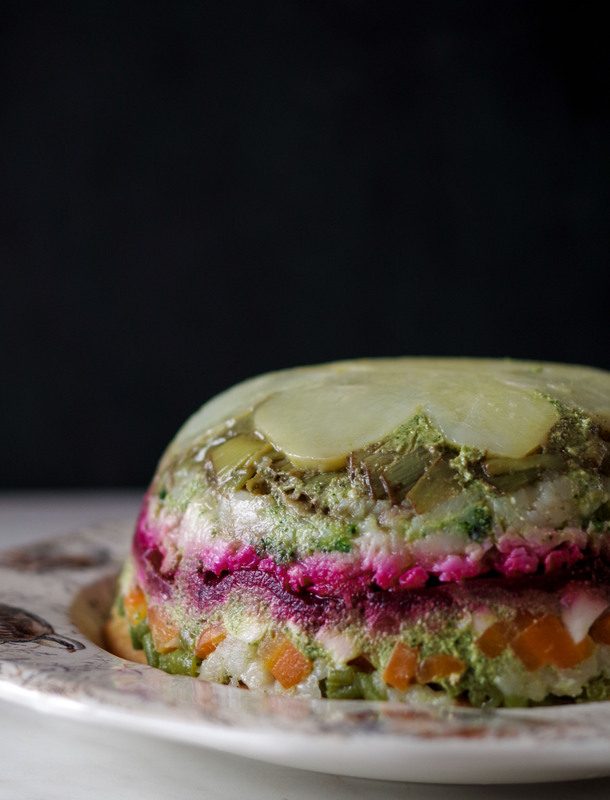 Today Cappon magro is rarely prepared at home, if not just for the holidays. Perhaps for the cost today not indifferent of raw materials. Perhaps (and above all I would say) for the long time it takes its composition. The best Genoese restaurants offer it in the menu, but – needless to deny it – they are always versions of the original recipe revisited – in a more contained key – to meet practical needs, first of all the mono-portion. But when you have the time and the desire to prove yourself, the result is delicious, surprising and opulent. It is not a difficult preparation itself. It’s just a question of organization. And then the light that will shine in the eyes of your guests when they will see your Cappon magro appearing on the table will be the priceless reward for the time and care given to it! All the traditional texts of Ligurian cuisine I consulted for the preparation of my Cappon magro, agree on the need for some mandatory ingredients: the hard crackers traditionally eaten by the sailors- and called “gallette del marinaio” – as a base, a nice fresh fish, different vegetables, the green sauce and some shellfish. But they leave all much freedom of interpretation both in the specific choice of fish and vegetables, both in the order with which the layers must be composed, and especially in the final decoration. Below is the written recipe that I followed and the photos I made. It is a medium-rich version, without oysters and lobsters as some ancient recipe books provide for, but perhaps it is more affordable for everyone. Have fun! 4 salted, cleaned and filleted anchovies. First prepare the green sauce. As it contains vinegar, you can store it in the fridge for a couple of days and therefore prepare it the day before you make the dish. Wet the breadcrumbs with vinegar, let it rehydrate and squeeze well. Wash and dry the parsley leaves and those of the heart of the lettuce (adding a small lettuce heart will make the sauce more delicate. The traditional recipe does not provide for it, therefore if you want you can omit it). The traditional recipe provides for the use of the mortar for preparing the sauce but for convenience (and a bit of laziness, I admit) I use the immersion blender. Therefore, in the bowl of the immersion blender insert the squeezed breadcrumbs, 4 tablespoons of oil, a tablespoon of vinegar, the pine nuts, half the parsley leaves and the garlic cloves. Blend until you get a cream. Then add the remaining parsley leaves, the lettuce leaves sliced, egg yolks, capers, salted anchovy fillets, green olives and another 4 tablespoons of oil. Blend again until you obtain a cream (it is not necessary that the cream gets too homogeneous). At this point add a tablespoon of vinegar, the remaining 4 tablespoons of oil and salt. If you like a more sorrel sauce just more vinegar to taste. First wet the crackers (or the dry bread slices) wet the biscuits with half water and half vinegar, add a pinch of salt and let them rehydrate closed between two plates (the original sailor's crackers used in the traditional recipe need at least a couple of hours to soften and a generous dose of liquid). Clean the broccoli and subdivide the florets. Peel the potatoes leaving them whole. Clean the artichokes, divide them into quarters, then reduce them further into slices and put them to soak in water and lemon. Cook the beetroot in the oven wrapped in baking paper at 200 ° C for 40 minutes. Boil all the vegetables separately until they are al dente and throw them in cold water to stop cooking and keep the color bright. When they are all ready, cut them into cubes, or into slices or sticks and let them cool after having seasoned them, all separately, with oil, vinegar and salt. Cut the carrot left whole into thin slices and set aside for the final decoration. Boil the shrimps and then shell them, cut them into small pieces, season with oil, salt and lemon and put them aside. Sauté the scampi in a pan and put them aside whole, they will serve as decoration. Boil the lobster or the giant prawn (I used an Argentinian king prawn) and put them aside whole, they will also serve as decoration. Cook the mussels in a pan with a lid for 5-10 minutes. When they are opened, open them in half by removing the part of shell that does not contain the body. These will also serve as decoration. Take a round bowl (about 20 cm in diameter) and deep. Cover it inside with transparent paper making sure that the flaps come out. Put the various ingredients inside the bowl in layers, spreading a thin layer of green sauce between them and alternating fish and vegetables. Every time you add a layer, make it homogeneous and compact it well downwards. You can be creative in choosing the order of the ingredients. I started with the slices of potatoes (because overturning then the bowl form a compact dome on top) and I put the red beet halfway because it is very flashy. Finish the layers with the crackers. Fold the edges of the transparent paper over the crackers layer and let it rest in the fridge for a couple of hours. For the decoration and presentation of the Cappon magro. Withdraw the bowl containing the salad from the fridge. Open the edges of the transparent paper. Place the serving dish over the bowl and turn it upside down with a quick movement. Helping yourself by lightly pulling the edges of the transparent paper let the salad go down and remove the bowl. On the serving dish you should now have a nice colored layered hemisphere ready to be decorated! Some recipes require that the whole salad is covered with green sauce and then decorated. I like to see the layers so I leave them clearly visible and I serve additional green sauce apart. 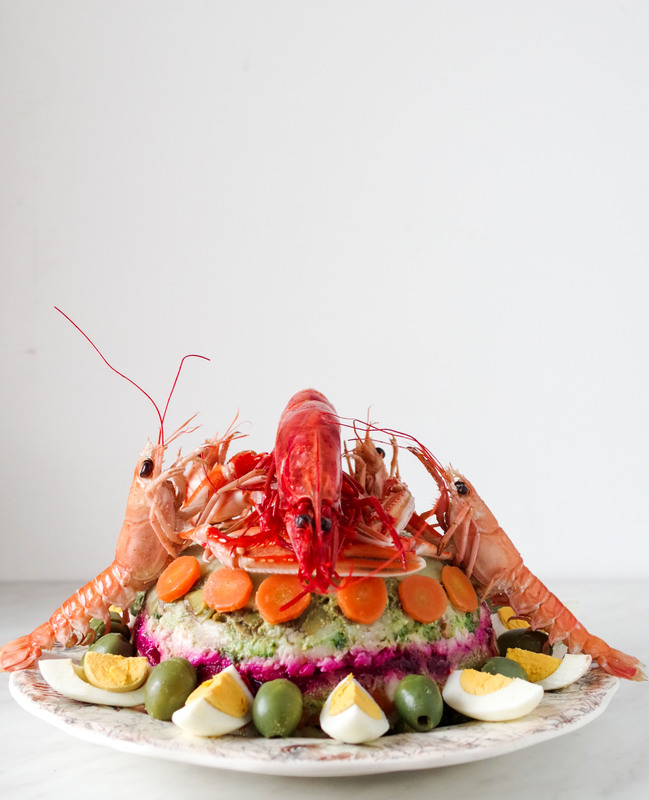 To decorate there are no rules, you can give space to your imagination using mussels, hard-boiled eggs cut into quarters, green olives, boiled carrot slices and the crustaceans. Keep your Cappon magro in the fridge and take it out a couple of hours before bringing it to the table so to serve at room temperature. Did you like this post? Don’t miss the next ones then! I made the cappon magro only once. I thought it very good, but the best part was the tuna fish which you do not mention. The white fish was sort of meaningless or tasteless in the whole. Unfortunately it is not understood in America, the tradition behind it being meaningless here. Mostly, they do not like it, they do not like the taste, I am afraid. Or may be I did not do it well? I will try again. Nini Greenman, New York. Dear Nini, thank you for reading my blog and the Cappon Magro recipe. The recipe I posted is the traditional Italian Riviera one. We use small white fishes boiled, octopus, shrimps, lobsters, but tuna fish is not a “traditional” fish here and no recipe mention it. Said this, I think that you can use it for making your own Cappon Magro if you like it. The mood of the recipe is (and originally was) to put together various fishes and vegetables for creating a spectacular seafood mouthwatering salad :). Cheers!